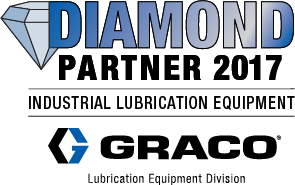 Motion & Control Enterprises LLC (MCE) is proud to announce it was recently awarded the prestigious designation as a Diamond Partner by the Graco Industrial Lubrication Division. The designation is an elite honor reserved for high performing channel partners who achieve specific proficiencies and capabilities as defined by Graco, including at least $1 million in annual sales. The award recognizes MCE’s success and enables MCE to leverage its partnership with Graco to ultimately benefit its customers.